With a myriad of options, travelling to Rotterdam is easy from anywhere in the world. Whether you choose to come by train, plane, boat or automobile, getting to Rotterdam is simple and convenient. You don’t need to already be in the Netherlands to travel to Rotterdam by train. 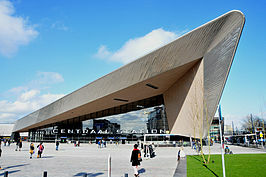 High-speed international trains whizz into Rotterdam’s futuristic Centraal station ten times a day. Take the Thalys from Paris (02h40), Antwerp (only 32 minutes) and Brussels (01h10), or if you are travelling from the UK, take the Eurostar to Brussels and change onto the Thalys for Rotterdam in Brussels. Read our top tips on travelling by train to the Netherlands from Paris, Brussels or Antwerp. And with hundreds of train connections to other Dutch cities, reaching Rotterdam is easy from any corner in the Netherlands. The NS Intercity Direct offers the fastest connection between Amsterdam (27 minutes), Schiphol airport (25 minutes) and Breda (25 minutes). It runs twice per hour, but you do need to pay an Intercity Direct surcharge. For timetables and prices see the national railways website. While you can’t fly directly into Rotterdam from New York or anywhere else in the United States for that matter, several regional and low-cost airlines fly into Rotterdam The Hague airport. Airlines flying in and out of Rotterdam airport include Transavia, CityJet, British Airways, bmi regional, Turkish Airlines, TUIfly, Lufthansa, Jetairfly.com, VLM, Vueling, Corendon and Onur Air. From Rotterdam airport to the city centre, you can either rent a car, take a taxi (10-15 minutes) or use public transport. 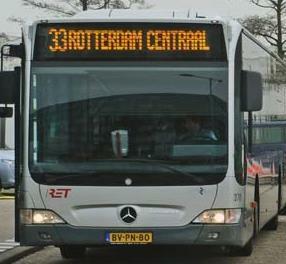 The RandstadRail and Airport Shuttle bus (bus 50) takes around 15 minutes, while RET (bus 33) takes about 20-25 minutes. If you have a GPS navigation device, then you’re all set for driving to Rotterdam. The A4, A13, A15, A16 and A20 motorways all lead to Rotterdam. You can either park in parking garages around the city, or make use of paid street parking. An alternative is to park in one of the Park & Ride locations on the outskirts of the city, where for a reasonable daily rate, you can park your car and travel on public transport into the city. What could be more romantic than sailing into Rotterdam by boat? If you don’t have your own yacht, then you can take the ferry from the United Kingdom. P&O Ferries sail from Hull to Rotterdam Europoort and Stena Line sails from Harwich to Hoek van Holland (30 minutes from Rotterdam). Copyright © 2019 Visit Rotterdam. All rights reserved.